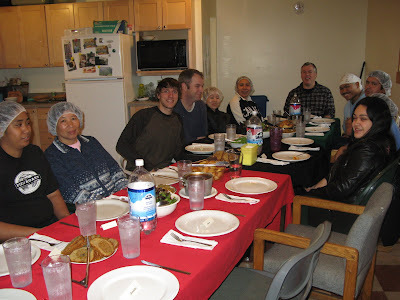 Once a month we all gather in our staff kitchen for a common meal. David will cook for us a fantastic vegetarian meal and often times spend the entire morning preparing it. Today’s was a traditional Thanksgiving meal though completely vegan. We of course had our Celebration Roast topped with our Porcini Gravy. There was salad greens, peas dressed with oil and garlic, and the Lee family recipe potatoes. David will have to impart that secret himself, but they are so crunchy on the outside and soft inside. Kinda like fried mashed potatoes…but quite a bit healthier! I happened to bring in the stuffing I made last night for the photo shoot today, and shared that with everyone. David made pecan & apple pie too, ala mode with soy delicious ice cream. Yum!